Get everything you need in one power packed countertop unit. 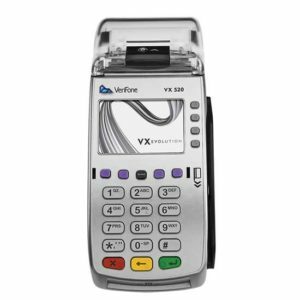 The Verifone VX520 is one of the most popular credit card machines on the market, for a reason. It packs a super fast processor and has a high speed ethernet port for running cards with speed. Customers love the simple and intuitive experience. 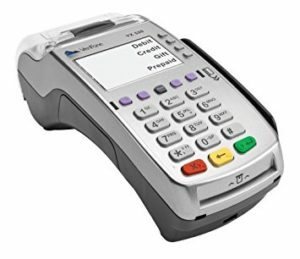 Seamlessly integrate the VeriFone VX805 PIN pad for customer facing interface that allows customers to swipe their own card and enter their PIN for debit card transactions. Card slot allows to EMV transactions, NFC capabilities accept payments from smart devices, and side swiper takes care of the rest. Get everything you need in the Verifone VX520 credit card machine. HMS designed custom gift cards that work with our terminal just in time for the holidays. 🙂 Terminal works pretty fast. I give it an A. My only issue is that the terminal is a bit large for my counter, but my counter is very small. I got a stand and fixed my space issues. Terminal would be fine on a normal counter size counter. I'm so glad we got a new machine! You never know how bad the old one is until you switch! Takes chip cards and regular and apple pay. We haven't had any issues with this machine. It's fast and accepts all payments we need. Takes chip cards too. HMS has great service. Setup was easy.